I recently visited your store to purchase a pair of 99p laces, Tracy was happy and keen to help me find the right ones. I was extremely happy with the customer service I received for such a small item. couldn't find my size Tammy checked to see if my size was available fetched it and made sure i had everything I needed, she was very chatty and friendly. 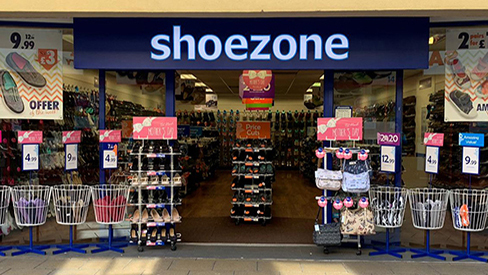 I had a nice shopping experience and shoezone thanks to the helpful staff nothing was to much trouble for them. A full and tidy store with polite and friendly staff . I am always able to find just what I want at shoe zone . Always an enjoyable shopping trip. On purchase i found the customer Service to be excellent. I was served by Lynda whom was very polite and helped me choose a very reasonably priced pair of shoes and the correct polish to go with them.I am very happy with the overall experience. The young lady (lynda) was very helpfull guiding me towards the slippers that were in the 2 for £8 offer which i was looking for. I recently visited your Newark branch to help find my grandma some shoes. The staff were all a great help to us and made me and my grandma feel at ease. Just wanted to take some time to say thank you to the team! Tammy was plesent and very helpful going out of her way to help me. The store was clean, tidy and very welcoming.